Who says a panini must use meats and veggies? This unique dessert breaks all the panini rules. Imagine tender apples and sweet spices piled high on crusted-raisin bread. The honey-whipped mascarpone is the stellar ingredient. It sends the flavor profile over the top! Serve with some vanilla bean ice cream for a classic touch. RecipeSavants.com Who says a panini must use meats and veggies? This unique dessert breaks all the panini rules. Imagine tender apples and sweet spices piled high on crusted-raisin bread. The honey-whipped mascarpone is the stellar ingredient. It sends the flavor profile over the top! Serve with some vanilla bean ice cream for a classic touch. Smart Recipes, American Recipes, Dairy,Vegetables Recipes, Recipes Dairy,Vegetables American Apple Pie A La Mode Panini PT30M Serves 4 Ingredients: 0.5 Cup Mascarpone Cheese 2 Teaspoons Honey 0.5 Cup Butter 8 Thick Slices Cinnamon Raisin Bread 1 Large Granny Smith Apple 2 Tablespoons Light Brown Sugar In the bowl of a food processor, add cheese and honey and whip until light & fluffy. Set aside. On a flat work surface lined with a sheet of parchment paper, arrange the bread slices. 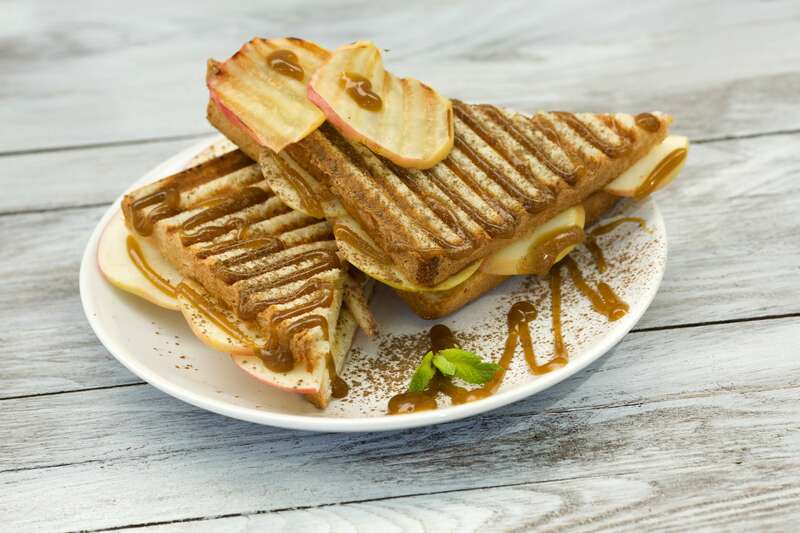 Spread 1 tablespoon of cheese mixture on each slice of bread, and layer 4 slices of apple on 4 slices of bread, top with another slice of bread and sprinkle with 1/2 tablespoon of brown sugar. Place a sandwich in the grill and toast until golden brown, about 3 to 5 minutes. Repeat with the 3 other sandwiches. Cut panini in halves and top with vanilla bean ice cream.